Proving the axiom that the best lobbyists for an industry are the industry members themselves, more than 175 marine representatives made their way to the nation’s capital in May to promote the boating business to federal lawmakers at the American Boating Congress. The group, representing 26 states and Canada, spent two days discussing issues of vital importance to boating — from tax reform to ethanol to life jacket use — and ended with an afternoon on Capitol Hill, meeting with 110 congressmen and senators and/or their staffs to discuss these issues. While some of the issues may seem old hat, such as asking legislators to support the Business Activity Tax Simplification Act, Dammrich says it can take as long as seven years to get a bill passed. “You’ve got to have perseverance and you’ve got to stick to it and you’ve got to keep delivering the message consistently,” he says. ABC also included a reception for BoatPAC, the industry’s Political Action Committee, which donates money to friendly lawmakers. “The PAC was approaching over $400,000 per election cycle — and that’s a two-year election cycle — before the recession,” says Dammrich. “That was truly outstanding. During the recession, the contributions fell off dramatically. We’re about $80,000 for the last two-year election cycle. One of the goals that the NMMA board has established going forward, or one of the priorities to strengthen our advocacy efforts, is to return the PAC to $500,000 in each two-year election cycle. 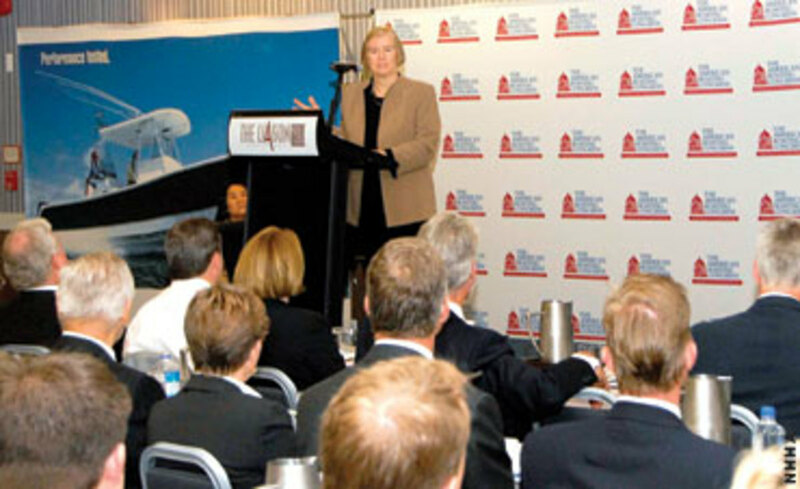 Conference attendees heard from Congressional Boating Caucus co-chairs Rep. Candice Miller, R-Mich., and Rep. Joe Donnelly, D-Ind., both of whom spoke about the issues and challenges facing the industry. Those issues include rising fuel prices, tax reform, invasive species, harbor maintenance through dredging and more. Miller, who grew up in her family’s marina business, says she is “painfully aware” of the effect the economy is having on boating. “I know that the boating industry is an industry that perseveres,” she says. 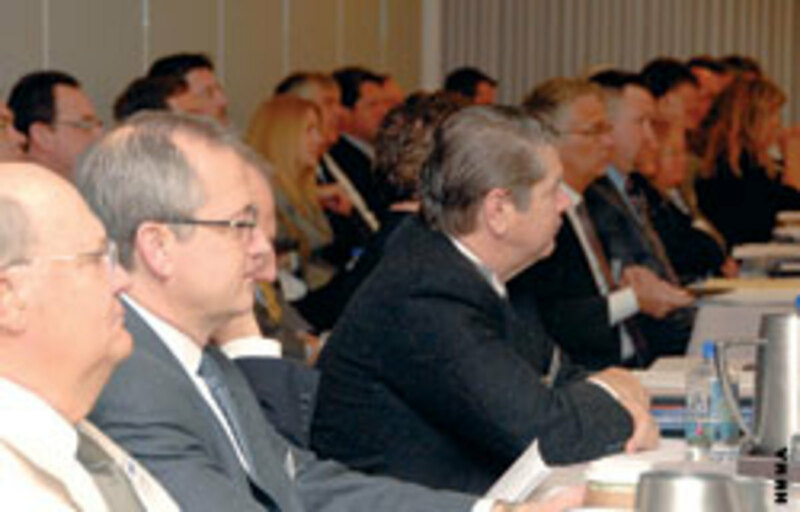 Attendees were briefed on issues up for discussion during Hill visits, as well as the industry’s position on them. Jim Currie, the NMMA’s legislative director, talked about opposition to the increase in ethanol in gasoline from 10 to 15 percent. He told ABC attendees to point out that ethanol is harmful to marine engines and that no testing was done on marine engines before the change was announced. “If Iowa were not the first caucus state, we probably wouldn’t have this problem,” he says, a reference to the strength of the corn lobby. Jeff Gabriel, the NMMA’s legislative counsel, says it is important to ask lawmakers to support reauthorization of the Sport Fishing Restoration & Boating Trust Fund as part of the 2011 highway bill reauthorization. The fund, he points out, brings in $650 million a year, which goes toward stocking fish, creating boating access sites and more. When looking at the massive highway bill, $650 million is a drop in the bucket, he says, and the last time it was reauthorized, this provision was added at the last minute because it had been forgotten. Gabriel also urged attendees to request support for the Business Activity Tax Simplification Act to modernize state business activity tax laws to combat states’ aggressive expansion of their tax jurisdiction over out-of-state businesses. This bill needs more co-sponsors, he says, acknowledging it’s a “hard sell with the economy the way it is.” Other issues of importance, he says, are support for free-trade agreements, a simplification of the tax code and support to make the R&D tax credit permanent. Cindy Squires, the NMMA’s chief counsel of public affairs and director of regulatory affairs, discussed a federal proposal to make life jacket use mandatory. The Army Corps of Engineers is conducting a test on PFD use and can impose the requirement around the country without allowance for public comment. “This is a huge policy change,” Squires says, contending that it needs public input. Squires also discussed a recent “shock ad” from the Coast Guard implying boating is not only dangerous but potentially life-threatening. Though this particular ad, after some complaints, was taken off the Coast Guard website, it’s possible a similar ad could be brought back, she says. She urged attendees to ask their lawmakers to halt any efforts mandating life jacket wear in all circumstances until there’s public engagement. ABC also included sessions with Greg Ip, U.S. economics editor of The Economist; a meeting with representatives of the Environmental Protection Agency about the Clean Boating Act; a session with Frank Peterson, president and CEO of the Recreational Boating & Fishing Foundation; and a discussion with Misti Dragano of the American Sportfishing Foundation. Rich Kolb of Volvo Penta, Jeff Wasil of Bombardier Recreational Products and Mark Riechers of Mercury Marine received Environmental Leadership awards for their support of a landmark test project conducted last year on greenhouse gas emissions. The following technicians on the project were also recognized with an Environmental Achievement Award: Mel Cahoon, Bob Crocker, Dave Wilson and George Zoubul of Volvo Penta; Mike Reichenberger and Jeff Dudarenke of Mercury Marine; Bill Ziehm, Jerry Oliver and Tony LaVigna of Bombardier Recreational Products; and Thomas Wallner of Argonne National Labs. Next year’s American Boating Congress is scheduled for April 23-24.